Franz Danzi's Wind Quintet in d minor, Op.68 No.3, was the last such work he was to write as he died not long afterward. In many ways it is the summation of his art with respect to this type of composition: appealing melodies, concisely wrought with excellent part writing. 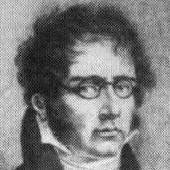 Franz Danzi chose to write wind quintets after witnessing the tremendous financial success of Anton Reicha's first set of such works published in 1817. Danzi, who had a gift for writing melodies, lavished considerable care on his quintets, but, unlike Reicha, composed them for Everyman--the average player--and not for players of a virtuoso caliber. Franz Danzi (1763-1826) was born near and grew up in Mannheim. He studied cello with his father and composition with Abt Vogler before he joined the famous Mannheim orchestra of the Elector in 1778. His career spanned the transition from the late Classical to the early Romantic styles. Danzi knew Mozart and mentored Carl Maria von Weber. In 1783, Danzi succeeded his father as one of the conductors of Elector’s orchestra. He eventually rose to the position of Kapellmeister at the courts in Munich and later Stuttgart. He was a prolific composer who wrote works in virtually every genre. Danzi's chamber music includes sextets, quintets, quartets and trios, some for strings, some for wind instruments and some for a combination of the two. These works are generally in a style that reflects his own early experience in Mannheim. The Wind Quintet Op.68 No.3 in d minor is the third and final work from his last set of wind quintets. After the success of his Op.56 in 1821, Danzi followed it up with two more sets a few years later. The Quintet begins with a quiet, somewhat haunting Andante sostenuto, an extended introduction in the minor. The main part of the movement, Allegretto, is characterized by a jaunty theme which brings to mind a leisurely steeple chase. (our sound-bite starts here) Next comes a charming Andante, perfect in everyway. A sprightly Menuetto and nicely contrasting trio lead to the exciting finale, Allegro assai. Our edition is based on the original edition by Andre of Offenbach, however, we have entirely reset the work, added rehearsal numbers and corrected mistakes. This is a tuneful work which should be enjoyed by quintet groups be they professional or amateur.